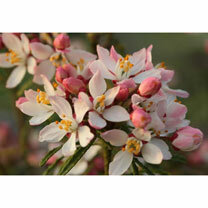 The newest Choisya around and only just launched offering the unique bicoloured flowers of pink and white. This compact evergreen shrub has much finer palmate leaves than most others as well providing a more delicate appearance and adding interest all year round. Flowers April-May & August-September. Height 1-1.5m (3'3"-5'); spread 50-60cm (20-24"). Supplied in a 2 litre pot.